Categorize your services by adding additional service types. Service types let you to categorize the types of service that you offer. By default, your Current RMS system comes with four default service types that you can choose from: crew, location, transport, and other. Service types show up in your services screen and can be used as criteria for searching and sorting. Service types also behave similarly to product groups in that they’re also used to group services together on an opportunity. For example, if you add a lighting engineer and sound engineer to an order and they both have the service type of “Crew,” you’ll find them listed under a group called “Crew”. Don’t forget, you can always change an opportunity group name by clicking on it. Service types are stored as a list of values. To add or make changes to your service types, go to System Setup > List of Values and click the blue arrow next to Service Type. Choose Edit on the menu that appears. 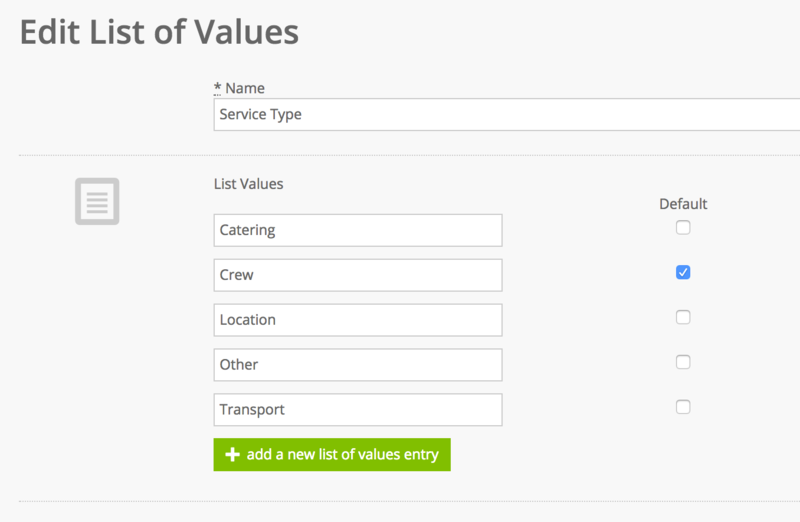 Tap the green add a new list of values entry button to add new service types. Use the default checkbox to specify an item in the list that should always appear first. Add as many entries as you’d like and click Update List of Values when done.